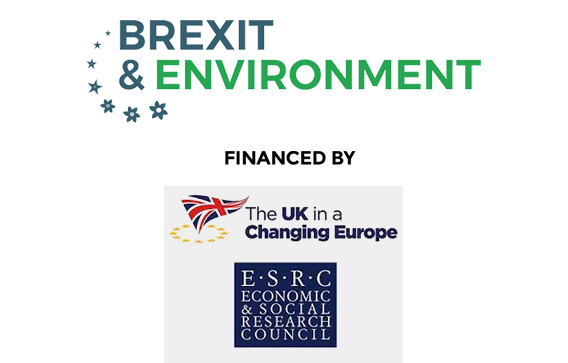 This blog post summarises Prof Chris Hilson’s (University of Reading) introduction to the Brexit and the Environment roundtable organised by the British Academy and EUrefEnv on 30 January 2017. He argues we need to understand EU-UK environmental relations have gone both ways, and environmental leadership is not constant in time. 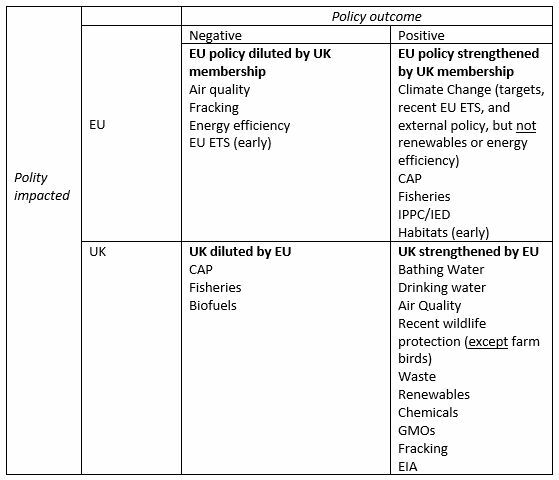 The interaction between the UK and the EU in environmental policy can be understood in a bi-directional and bi-dimensional manner: in other words, one which shows that the impacts have not all been one way, and have not been uniformly either positive or negative (but rather a mix of both) (see for example IEEP, 2013). 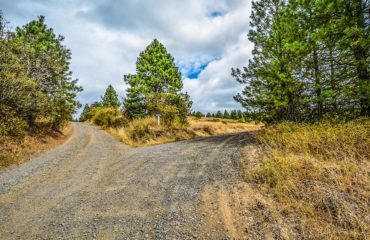 In the campaigning and debate leading up to the EU referendum, the emphasis by those on the Remain side was typically on the ways in which the EU had been good for the UK environment and how leaving would therefore be harmful. 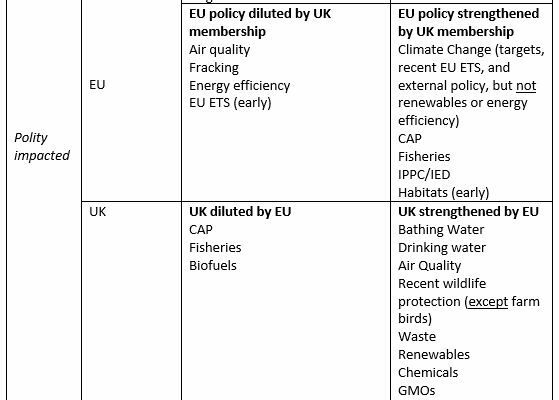 This side of the argument is captured by the bottom right hand box of Table 1 and the policy areas contained within it such as drinking water, bathing water and waste policy, where EU Directives have undoubtedly led to significant improvements in UK standards. Many did however also mention the few areas in the bottom left hand box where EU policy has not necessarily been environmentally beneficial for the UK, including in particular the Common Agricultural Policy (CAP) and the Common Fisheries Policy (CFP) (see for example Monbiot, 2016 or Peter Lilley MP’s dissenting report). The former, for example, has gone hand in hand with an intensification of agriculture and has been associated, inter alia, with a decline in previously common farmland birds and diffuse nitrate pollution of watercourses from fertilisers (Burns and others, 2016; IEEP, 2013). Understandably in a referendum aimed at persuading UK voters, the effects of UK membership on the EU received less attention. 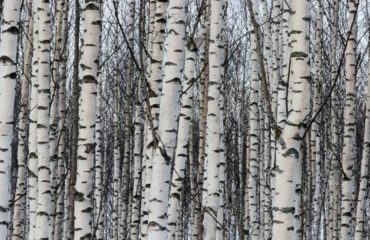 However, in assessing the overall effects of Brexit on the environment, these effects – set out in the top half of Table 1 – also require careful consideration as part of a bidirectional assessment. Some have been positive: thus, for example, the UK has driven the EU on climate change targets and has encouraged the greening of the CAP (Burns and others, 2016; IEEP, 2013, Gravey and others, 2016). It was also instrumental in the design of the IPPC industrial emissions regime (which later became the Industrial Emissions Directive). EU external policy on the environment has also been enhanced by UK input, especially in the area of climate change negotiations. Membership of the EU has given the UK more influence than it would otherwise have had – the UK gets the benefits of putting forward its own views but with the added weight of a larger bloc’s platform to support them (Burns and others, 2016, Energydesk 2016). 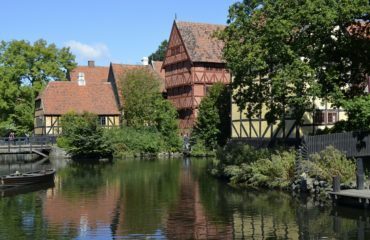 Other effects, where the UK government has blocked or watered down EU environmental legislation, have been negative. Recent examples include air quality, frackingand energy efficiency. It is tempting to see the relationship between the EU and UK in static rather than dynamic terms across time. The temptation is thus to regard the UK as forever the laggard and the EU as always the leader. 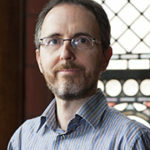 While it is not hard to see why pre-referendum campaigning on the Remain side would take this stance, in reality the UK government’s environmental credentials have fluctuated over time and across environmental policy areas, and the EU’s environmental record also changes according to the political complexion of the Commission and governments in the Council of Ministers. In relation to the former UK stance, some of the policy areas listed in Table 1 provide a good illustration of this. Thus, for example, the EU Emissions Trading System (ETS) could legitimately be placed in either of the top two boxes. Insofar as the UK pushed for this policy in the first place (Burns and others, 2016; IEEP, 2013) and it has become regarded by many as a somewhat ineffective neoliberal instrument,it might legitimately be put in the top left hand box. However, the UK has also been instrumental more recently in trying to strengthen the policy by restricting allowances (Burns and others, 2016), which could mean UK influence belongs more in the top right hand box. Similarly, while the UK was an early advocate of nature conservation laws and was thus supportive of the Habitats Directive at the time of its inception, in recent years the concern is that the Government has come to regard the Directive as something of a burdensome obstruction to development projects.As regards the changeability of the EU vis-a-vis the environment, the current Juncker-led EU Commission for example worried some with its Better Regulation-based ‘fitness check’ of the Birds and Habitats Directives (IEEP, 2016; Gravey, 2016). 2010/75/EU  OJ L 334/17. cf N Haigh, EU Environmental Policy: Its Journey to Centre Stage (Routledge 2016) pp 197-203, noting resistance to the British idea of a single permitting authority. See eg G Winter, ‘The climate is no commodity: taking stock of the emissions trading system’ (2010) 22(1) Journal of Environmental Law 1. European Union, Energy and Environment Sub-Committee, ‘Brexit: Environment and Climate Change’.